What Is A Christian Worker? How Many Types Of Lodging Are There? The answer to the question posed here is: “Far more than most people imagine, and more than can reasonably be covered in 350 words.” Here are definitions of those most frequently found. Hotels are the obvious place to start, since they are the form of lodging that comes into most people’s mind first. At its simplest, an hotel is a building containing bedrooms that visitors can pay to stay in. Most (though not all) also provide breakfast and many serve other meals, too. There may be a bar; there may also be so many other services as to be impossible to count. Hotels range in quality and level of service provided from 1 star to 5 stars. All the visitor is promised by a B&B is a bed to sleep in at night and breakfast in the morning. A B&B may be no more than a room in a private house or it may be something that looks like an hotel but prefers to describe itself in this way because hotels are required to accommodate anyone who asks, while the owner of a B&B may wish to exclude – for example – children. It can be difficult to distinguish between an hotel and an inn; generally speaking (though not in all cases) the inn will be smaller, more intimate and more built around a bar or series of bars. Think of it as a drinking establishment with rooms. The expression “restaurant with rooms” is usually used to describe an hotel with a particularly good restaurant – somewhere the visitor goes primarily for the quality of the food and not out of need for a place to stay. A pension is a guesthouse or B&B that is usually family-run and offers lunch and dinner as well as breakfast. Fellow-guests in a hos tel will usually be students or backpackers; the common factor will usually be that they don’t have a lot of money. 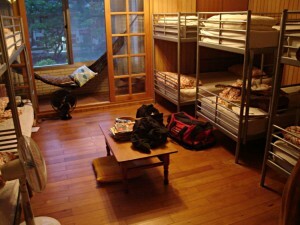 Sleeping is often dormitory-style and facilities like bathrooms will usually be shared.